I don't always have the best experience with time-travel stories. They either don't have enough details about traveling, they have entirely too much scientific detail, or they don't spend enough time with the actual business of traveling. Because of my extreme time-traveling picky-ness, I was wary of Into the Dim. But man, that cover! I am so happy to say that THIS story hit all the right notes for me! Thank you, awesome cover people! Hope has just attended a funeral where her father has buried an empty casket. The casket is supposed to represent moving on from the death of her mother months before, but Hope isn't ready to let go. She believes that her mom is still alive. After all, her body was never found after the earthquake. But her dad needs closure, so... empty casket. After the funeral, Hope receives the awful news that her father is sending her to spend the summer with her mom's sister, a woman she has never met, so that he and his new girlfriend can go on a cruise. Though she is none too happy about this turn of events, she decides to go visit her aunt rather than the alternative. A summer with the grandmother who has made it no secret she despises Hope. Once she arrives at her aunt's manor in Scotland, she stumbles upon secrets that will shatter her world, and a possibly love who might just shatter her heart. Either way, after this summer, Hope's world will never be the same. Hope was, at first, hard to relate to. She was incredibly skittish, had some serious phobias, and it is admittedly hard to relate with a photographic memory. She was scared of everything, and never stood up for herself. As the story progressed though, the growth in her was remarkable... and thankfully believable. She became a strong, dependable women with a backbone and the ability to lead. We also have the pleasure of meeting several other characters in the story who were all just as wonderful as Hope. Phoebe and Collum, also time-travelers, were the first true friends that Hope has ever had. Collum, who was gruff and sometimes harsh, but loyal and brave. And goofy, kindhearted Phoebe who definitely provides comic relief. There were so many wonderful characters, especially when the gang travels to 12th century London, that I would love to talk about at length but the one that I can't forget to mention is Bran. Hope's possibly love interest, but a boy with his fair share of secrets. He and Hope seem perfect, but you just know the fantasy will burst. But hope is never dead! Finally, I just want to mention the world-building. You can tell that this author wanted to be authentic to the time she was describing, and while I may not be a history buff I believe that she did a dang fine job of it. I was completely immersed in the history of London from long ago. I love that the author didn't just throw in some random facts and go. She put the work in, and because of that the story was made so much better. Into the Dim was a good, solid story. Other than some pacing issues, I truly enjoyed myself. 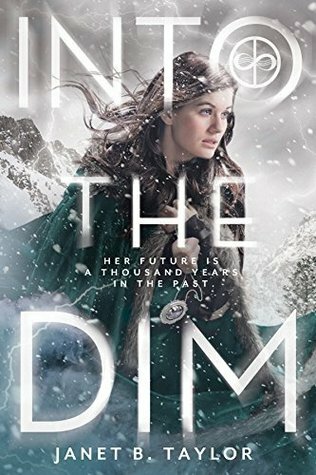 Beautifully written, with wonderfully flawed characters, and thoroughly researched histories, Into the Dim is a story that I will easily recommend. Janet B. Taylor is a dang good author, and I am so glad that I took a chance one her story! Bravo - I really do like time travel stories. I get your issue with them - sometimes it can just all go wrong. Glad to hear this one worked for you - I'll have to check it out! I'm glad that the fantastic cover made you pick this one up after all. I love time traveling books, so I'm pretty sure this one will be right up my alley! I was so curious about this book, so it's good to know you enjoyed it. Thanks for the review, I'll try to find time to read this!